Earlier this week we were visited by Dr. L. Venkatachalam, environmental economist at Madras Institute of Development Studies. He will be presenting to us a couple more times in the next few weeks, but this past week he spoke about how urbanization in the city of Chennai was in large part responsible for the heavy flooding experienced in December of 2015. Flooding of streets in Chennai during the monsoon is nothing new, but the particularly heavy rains in late 2015 shut down the airport for several days and caused widespread damage throughout many neighborhoods. Causes of flooding, according to Dr. Venkatachalam, include loss of and degradation of wetlands and lakes, improper urban planning and development near those bodies of water, waste management practices that clog sewers and degrade water quality, and poverty, migration and slums. In the 4th largest city in India, with the 6th highest population density of over 26,000 persons per square kilometer, the complex set of interactions of these factors leads to a host of problems, not just flooding. Dr. Venkatachalam illustrated the complexities with a case study of Pallikaranai Marsh. This is a somewhat unique and large urban wetland of originally over 5500 hectares. It now has only about 600 hectares of wetland. It’s unique in that it is a combination of both brackish water and freshwater wetlands, and is also a stopover for multiple species of migratory birds. Pallikaranai Marsh, in southeastern Chennai. You can see the road that has been built through the marsh. Encroachment for commercial, residential, and industrial development is the major reason for the 90% decline in surface area of the marsh. Infrastructure projects have included a large connector road that bisects the marsh and essentially cuts it into two separate wetlands. Another section of the marsh has been used as a dumping ground for solid waste, further decreasing the ability of the area to serve as a sponge to soak up precipitation. While not reducing the area of the marsh, illegal dumping of partially treated or untreated sewage further reduces the ability of the wetland to perform the essential ecosystem service of flood protection. It turns out that the area around Pallikaranai Marsh was one of the worst affected by the flooding in late 2015. 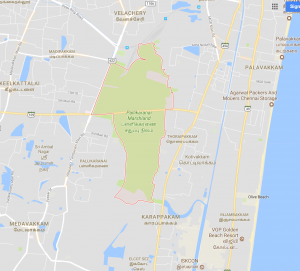 Many of the surrounding small wetlands that used to feed freshwater into Pallikaranai have been completely destroyed, reducing the ability of those wetlands and the major marsh to absorb massive amounts of precipitation and surface runoff. Now, it’s not all bad news. 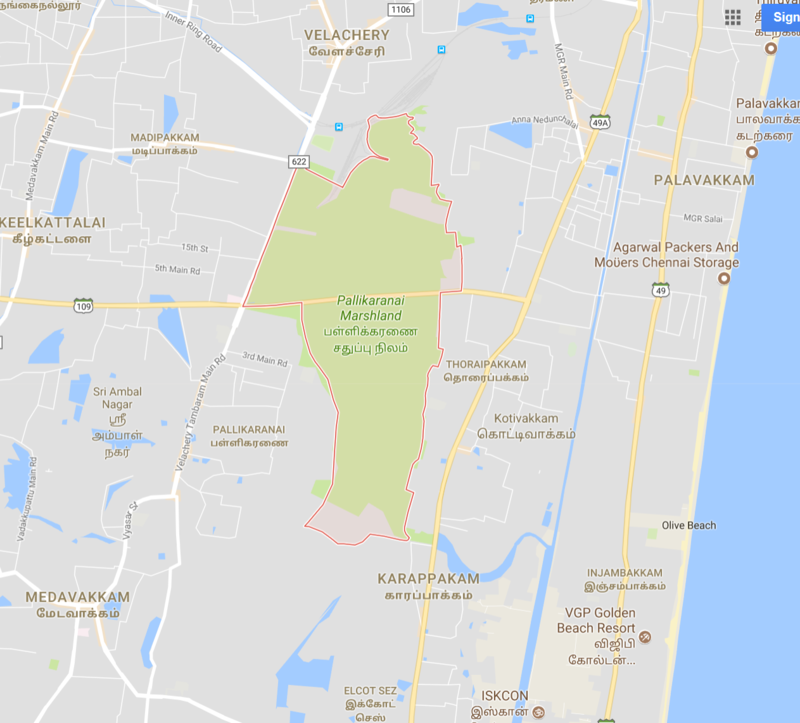 The Pallikaranai Conservation Authority exists to oversee conservation of the marsh, and it is housed within the Forest Reserve system. Rs. 1575 lakh ($2.5 million) has been set allocated to restore and improve the marsh and implement conservation measures, and a wall has been erected along a particularly vulnerable boundary of the marsh to prevent illegal encroachment, garbage dumping, and sewage discharge. Even more recently, Forest officials have constructed a 1,600-m embankment along the western part of the marsh, along Velachery Main Road. They have deepened and desilted 1,800 square meters along that stretch and will eventually erect a see-through fence along the road. In addition, there are several conservation groups dedicated to preserving this once-large and unique wetland (e.g., Nammapallikaranai.org).